I'm just coming back from the casino, where I get lots of ideas, as I mentioned before. In fact, today's harvest was about 20 units in 2 hours, with some Baccarat Banker win commissions involved. This time, I strategized before I went and used a specific method. Also a new idea came about by simple observation, both of which I would like to share with you today in this newsletter. Let's start with the specific method, the idea of which was used in the much more sophisticated method in the Cluster System for All Even Bets, that you can get for 50% off as part of upcoming holiday specials. In fact, any system you purchase from now until January 7 is granted to you half price. You will look for a pattern of 4-5 decisions to repeat itself either immediately or after a small number (2-3) of decisions. Once the pattern has repeated twice, you will bet against it with a 3 step Grand Marty progression: 1, 3, 7. Easily said, but this has numerous options and opportunities, from which to take advantage. We are not looking for a specific pattern of 4-5 decisions, but any sequence of 4-5 decisions to repeat itself. That's why you need to be extremely observant of what happens at the tables. You can watch for multiple opportunities in multiples tables over multiples games, such as Baccarat and Roulette. We'll look at Reds and Blacks in Roulette designated as R and B respectively, and at Player and Banker decisions in Baccarat designated as P and B. We can detect a pattern of 5 decisions, such as R R R R B that repeated itself with a B decision in between. We will then start betting on the opposite of this pattern, that is B B B B R, with the hope of catching one win within 3 tries. We can view the above sequence also as a pattern of 4 decisions R R R B that repeated itself with 2 decisions (B R) in between, where at the end of the repeat, we start betting on the opposite of this pattern B B B R, again with the hope of catching 1 win within 3 trials, using the 1, 3, 7 progression. The patterns R B R repeat also, but they are too remote from each other (9 decisions between them), so we won't consider them. Also note that if the sequence of the pattern consists like this, of only 3 decisions, it's advisable to wait for this pattern to repeat three times instead of twice before we start betting on its opposite. Betting immediately after R R R R B or the R R R B, on B B B B R or on B B B R, which is really betting on B B B only, since we only have 3 trials, we catch a win on the second bet, profiting 2 units. You have noticed that the Grand Marty of 1, 3, 7 makes you win 1 unit if you catch a win on your first bet, it makes you win 2 units if you catch a win on your second bet and makes you win 3 units if you catch a win on your third bet. If you lose all 3 bets, this costs you 11 units and you accept this as a losing run, reset (revert to betting 1 unit) and move on to other opportunities. Grand Marty is more aggressive than the double up classical Martingale, but it has some advantages. First, you win as many units as the number of bets you place. If you have placed 20 bets in different occasions, and you won all runs, which was my case, you will end up profiting 20 units. If you lose a certain run with -11 units, it will take not more than 4-5 runs to recover this, because those winning runs will profit you between 1 and 3 units each, depending on which stage of the 3 steps you win your run. The right side are the Blacks and left side the Reds. We can see a sequence of 4 Blacks turning into a Red, followed by the exact sequence of 4 Blacks turning into 1 Red. Or, as we have seen before, you can also view it as a sequence of 3 Blacks turning into 1 Red followed by a sequence of 3 Blacks turning into a Red with a Black decision in between. You can also detect a B B R sequence appearing 3 times. Remember that short sequences of 3 decisions need to appear 3 times before you bet on their opposite. In either case, when you start betting the opposite of those detected repeating sequences, you can see that you win your run on the second step of your progression thus making 2 units profit each time. You can detect the PPB sequence showing up three times (Hands 2-4, 7-9, 12-14), before you decide to bet on its opposite BBP at Hand 15 and win at the very first bet, 1 unit minus 5% commission on the Banker win. You can also see the sequence BBBP showing up twice (Hands 9-12, 16-19), before you decide to bet on its opposite PPP starting at Hand 20, and win on the third trial at Hand 22, with a Player win and thus no commission on your 7 unit bet and profiting 3 units for this run only. And yes, you can bet on all those found opportunities at the same time and take advantage of them all. See if you can find even more opportunities within the same short sequence above. Hint: PBBB appears twice at Hands 8-11 and 13-16. Bet B at Hand 17 and win one more unit. I hope you liked this simple strategy, which will also keep you alert and your eyes open. Almost like a game within a game. Have fun and profit at the same time. I promised to share also a new idea, which may not be too new to some of you with a lot of experience. 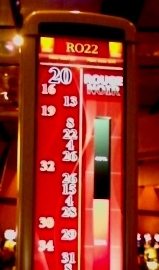 I came across a Baccarat table where there was a huge Banker dominance right up front. In fact, there were about 17 Bankers versus only 4 Player decisions at the very first 21 decisions of the shoe, that is 13 more Bankers than Players. Although, this may not be a too unusual case for a random game, but there are a few things that can happen. Either, the Player decisions will start coming up and will get close to the number of Banker decisions. Or the Banker decisions will remain dominant and will finish the shoe also with a substantial difference of 10-15 more Banker decisions than Player. In either case, if we start betting on Player only with flat bets, that is, without a progression and always betting the same amount, and this amount can be large, close to the table maximum if you like and if you can afford, in the first case you will make a substantial amount of profit, should the Player decisions start coming more often and in the second case, you may not make a profit, or break even, but also you won't be losing much, if the difference remains more or less the same. As I started betting on Player, the difference really started to close up. There were even 11 consecutive Player decisions at one point. I was not too surprised, based on the statistical law of even distribution, at which point one could simply leave the shoe. Then the Banker decisions started to come up again and the shoe finished with a gap of 5 more Banker decisions than Player. Considering that the initial difference was 13 and at the end this difference reduced to 5, one would have made 8 units betting on Player only until the end of the shoe. Another strategy is again betting on Player only and not be subject to those fluctuations of Player closing up and Banker opening up again. You would set a profit goal of say 5 units and quit when this was achieved. And to be on the safe side to also set a loss limit of -5 units if this happened before. In any event, for those cases, my simulations show that you will have more +5 unit sessions than -5 ones and thus win more often.